f you have a Minitar MVA11a and wish to use it as either extension or for use with you VoIP service. 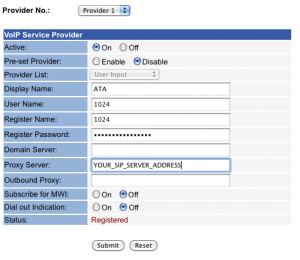 It is recommended that you set you Minitar MVA11A to use a static IP address on your network. Please consult your IT Support personnel if unsure how to do this. In order to use these instructions you will need to make sure you are on the firmware 15/06/2010 (030) or above. If your device is not on the latest firmware you will need to upgrade by downloading and following the instructions at the Minitar site – http://minitar.com/index.php?maincat=download. Ensure you take a backup of your configuration before upgrading firmware if your Minitar is pre-configured. When upgrading, you should firstly upgrade the firmware, then the DSP. Once the upgrade is complete, you can restore your configuration and test the unit. Connect to the Minitar Web Interface, consult the user guide for default username and password as well as locating IP address for the device. Now click submit and save. Once the device reboots, login and you should see Provider 1 registered.